I hope everyone has survived this last month of weather. Here in Naperville it has been a little crazy, 60 degrees yesterday and down to 35 tomorrow. I am ready for spring! Lots of new canvases have arrived from the Las Vegas Market. 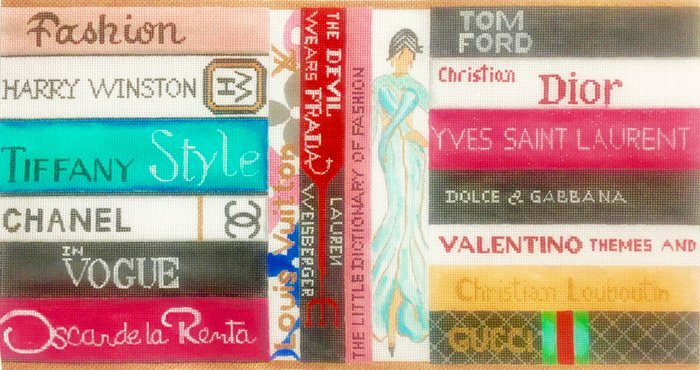 My favorite is Alice Peterson's "Fashion Books". I saw it and immediately knew "I HAD TO HAVE IT!" It's my Wednesday sit and stitch piece. If you are interested in joining in and stitching together, let me know. There are lots of new canvases in the "New Arrivals " section of our website -https://www.stitchersgardenil.com/ so check it out. We also brought back some of the new Planet Earth leather goods. There are luggage tags, credit card wallets, and coasters in fabulous colors. The price is very reasonable ranging from $38 for the luggage tag kit to $109 for a set of four coasters. "Finishing 101 with Edie Weilemann" is back for another run. This one day class will have you ready to give your 5" ornament as a gift in no time. Edie will show you how to finish your own ornament complete with backing fabric and corded trim. Requirements: Completed canvas no larger than 5" x 5" in size (mini socks are acceptable), two color options for backing fabric are needed, attendees will need to purchase thread for cording, and bring a pair of sewing scissors. A lunch break will be provided. Please call the shop to register at 630-946-6216. "Shaped Stand-up Finishing" with Edie Weilemann. Are you ready to move beyond ornaments and challenge yourself to more? Learn to finish your own stand-up! Friday, April 27, 2018, 9:30-2:30. Requirements: Completed canvas no larger than 4" wide and 6" high (instructor approval required) with a flat bottom, two color options for backing fabric, attendees will need to purchase thread for cording, and bring a pair of sewing scissors. Stuffing and weights are included in the class fee. A lunch break will be provided. Please call the shop to register at 630-946-6216. "Embellishment with Sandy Arthur" is on the books for August 2-5, 2018. Each stitcher will receive stitch suggestions for up to 6 areas on the canvas of your choice. Class size is limited. Please call the store for more details if you are interested. 630-946-6216. Did you know that we also have open stitching daily? You can stop by for a "Sit and Stitch" whenever we are open. The ladies and I love to have our back table full of Stitchers. Come any time Tuesday thru Saturday from 10-5.